1. Place the condensed milk into a bowl and add the icing sugar. Beat well then mix in the desiccated coconut. The mixture will get firm and difficult to stir but persevere until everything is all combined. 3. 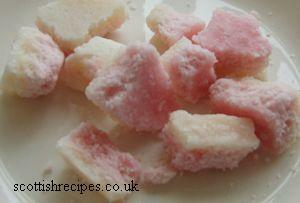 Cut into small cubes and spread on a sheet of greaseproof paper to dry slightly. 4. Enjoy and remember to share with the wee bairns! 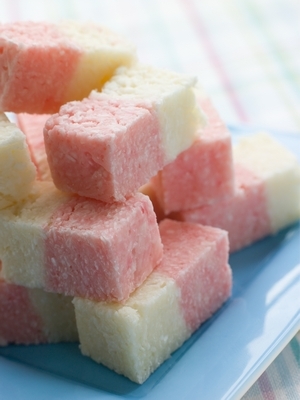 Add edible colourings for a festive/seasonal variety - black and orange at Halloween, blue and white on St.Andrew's Day, or red and pink at Valentine's.